Nigeria and the United Nations World Tourism Organization (UNWTO) on Friday in Madrid, Spain, signed an agreement on the hosting of the 61st UNWTO Commission for Africa (UNWTO CAF) Meeting 4-6 June 2018 in Abuja. The agreement, the signing of which was witnessed by the Nigerian Ambassador to Spain, Her Excellency Susan Aderonke Folarin, among others, contained the conditions for organising the meeting as well as other details. Speaking at the signing, the Minister said the Nigerian Government plans to use the opportunity of hosting the meeting to showcase the best of Nigeria to the world, saying Nigeria has comparative advantage and has taken the world by storm in the area of music, movies, theatre and other aspects of the Creative Industry. ”Nigeria does not take the confidence for granted and will not disappoint. In this regard, the meeting’s main organising committee, as well as the sub-committees, are leaving no stone unturned to stage a highly-successful meeting. The Minister said the hosting of the meeting is coming at a time that Nigeria has become a top destination for investors, especially with the Nigerian stocks having risen 12 percent this year, the highest globally,and the fact that Nigeria has moved up 24 places on the World Bank’s Ease of Doing Business ranking, earning a place on the List of Top 10 in the world. 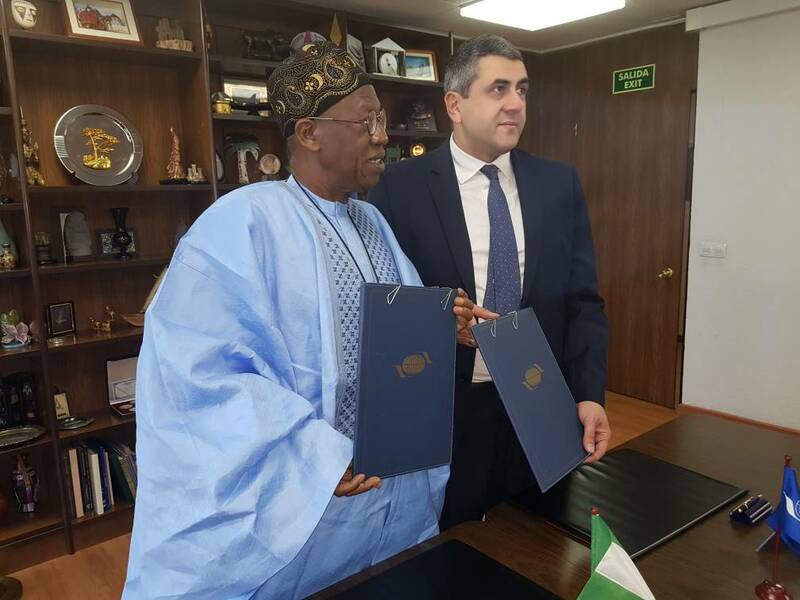 The Minister of Information and Culture, Alhaji Lai Mohammed, displaying copies of the signed Agreement on Nigeria’s hosting of the 61st CAF Meeting, in Madrid, Spain, on Friday.